I should go ahead and apologize now, but for the next few weeks, there might be a lot of stories that start with “when we were in London…” and it’s because travel really gets my creative juices flowing and it’s easy to pull inspiration from our time abroad, so just bear with me! So, when we were in London we drank green juice literally everyday. I know its become really popular at home too, but I was really blown away by how often we found it on menus. Anywhere from Mexican restaurants to French restaurants had it and I really loved it. I always feel like I eat kind of unhealthy on trips and this was a nice way to get in a few extra nutrients each day. Since being back, I’ve been trying to drink more juice and generally eat a lot healthier. I’m not doing the full on Whole 30 challenge, but I have been trying to make more recipes that fit into that category. If you’re not familiar with Whole 30 you can read about it here, but for a quick overview, you have to eat whole foods — nothing processed, no dairy (eggs are okay), no sugar, no alcohol and no wheat or grains. I’ve been trying different veggies and challenging myself to stop just buying what I usually do. 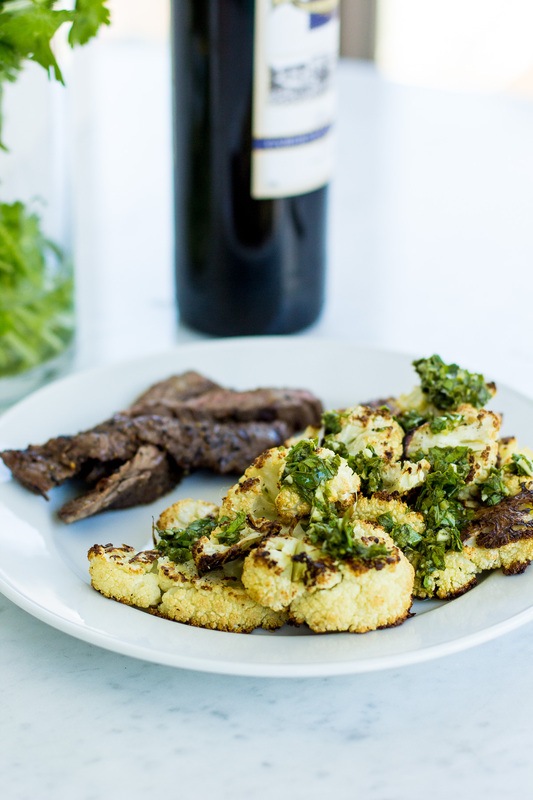 Recently I made this roasted cauliflower dish and served it alongside some grilled flank steak and it was fabulous! What I love about this style of eating is that you still get to eat really good food! I loved that this dish was super flavorful and easy to make. I’ll be adding it to the mix more often! You can find the roasted cauliflower recipe here. I pretty much followed it exactly, but added some cilantro to the mix because I didn’t have a full cup of parsley — good decision. I also cut my cauliflower into smaller pieces instead of big steaks to cut down on cooking time. Side note, the gremolata also tastes really yummy on the steak! Has anyone tried doing the full on Whole 30 challenge? I have some friends who have done it and said that yes, it was challenging, but that they felt amazing during and afterwards. I’m tempted, but honestly giving up wine for a whole month seems impossible to me — is that bad? !